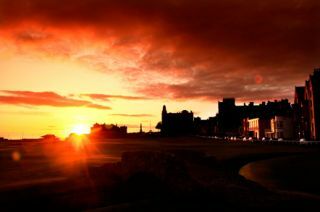 Needing no introduction, St. Andrews , the "home of golf", has seen the game played on its grounds for over five centuries. Famous for its wide, rolling fairways and massive double greens, the Old Course is a must for any golfer visiting. However, since play there is in ever-increasing demand, visitors should request tee times at least twelve to eighteen months prior to travel. Playing a course whose bunkers have such imposing names as Grave, the Coffins and Hell is the experience of a lifetime. St. Andrews is, indeed, unlike any other course on earth.